The drastic changes in your body and mind during menopause can result in some of the worst mood swings you have ever experienced. You may be familiar with the symptoms from premenstrual syndrome or even during pregnancy, but they can intensify during menopause. This is because your levels of estrogen, progesterone, and testosterone are dramatically reducing. The drop causes an alteration in brain chemicals that are responsible for maintaining a positive mindset. If you are prone to this side effect of menopause, then you should expect one or more of the following symptoms. Mood swings can cause extreme sadness. This may make you feel hopeless and deflated. Sobbing uncontrollably may become a weekly or even daily activity that can get you down. This can be due to the decreased levels of serotonin, which ordinarily maintain happiness. The drop in mood may cause a lack of inspiration to do the things you love to do. Instead of getting creative, going out to a park, or fulfilling duties, you will sit around sulking and procrastinating. This can cause a lack of expression, and obligations will build up. The dip in endorphins and rise in the stress hormone - called cortisol - will make you unnecessarily tense. Your mind will obsessively worry about every little thing, and it will become impossible to focus or find peace, even when you want to. Stress and despair can make it hard to fall asleep at night, causing insomnia. The continuous thinking takes a lot of mental energy, so if you are not able to recharge with a good night's sleep, you will be exhausted. Fatigue can make you irritable and lack stamina to do what you need to. 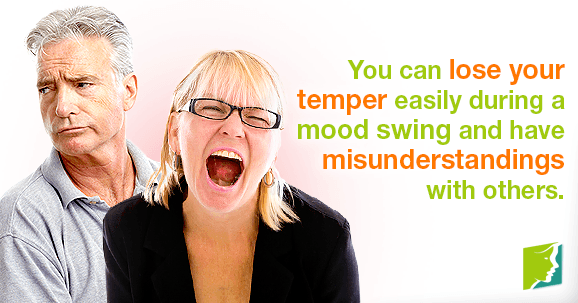 Even if you are normally a nice person, you can lose your temper easily during a mood swing. Everything that people do becomes aggravating, and you will be more likely to have misunderstandings with others. This can cause you to yell at others and say harsh things that you don't really mean. The anger and depression may cause distance between you and others. Your self-esteem can go down, and others may be upset at you for things you have said. Especially if your loved ones do not know what you are going through, this can be a very lonely time. You will also likely opt out of outings with others that you would have ordinarily engaged in, causing prolonged distance. The unfortunate outcome of these symptoms is, at times, unhealthy life choices. Since the feelings can be too hard to bear sometimes, you may resort to sugary foods, fatty foods, alcohol, and even drugs. These will only worsen your symptoms. Some women also turn to antidepressants, which are extreme and can make you less stable in the long run. Many women who are experiencing menopause do not feel like themselves as they are going through it. They often feel like an emotional wreck, with no ability to pull themselves out. It is important to know that the shift is a result of changes in the body, and will pass soon. Mood swings are temporary, but if they last continuously for more than five days, you may want to get checked for major depression or bipolar disorder.Hormonal imbalance is the key to avoid symptoms.Keep reading to know mood swings treatments.